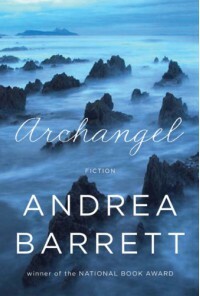 Another great collection by Andrea Barrett, one of my favorite authors. A wonderfully structured collection, too, the five stories create a nice symmetry with repeated characters and chronology. Readers of Barrett's previous collections and novels will recognize a few faces, as well as the name of a book or two. This is the tale of my nasty book-buying addiction. Since 1998 or so, for every five or six books that I bought, I'd read maybe one, leaving something around 80% of my library (over 1000 books) unread. Most of my library is still in boxes: we don't have enough room in our house to display all of them. My office is a mess of boxes and books, and I can't work in there because of it. To fix this problem, I've instituted a new system I call the Clearing: for every new book purchased, one book from the stacks must be read, and then a decision made: keep or give away. The Clearing, step 2.0, continues with The Pursuit of Love. 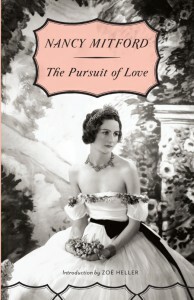 How long has The Pursuit of Love been in the stacks? 2008? I can't remember if this came from the great trove I amassed during the shortlived years of Goodreads Bookswap, or if I purchased it around the same time. I needed it for my bookshelf, duh! And it was probably cheap, and Modern Library edition, which look so lovely on a shelf. . .
Why didn't you read it when you bought it? I needed it for my bookshelf, but I didn't have time to read it. I was too busy buying other books I needed for my bookshelf. Linda Radlett, and her family. Possibly also about beauty and maybe about the dangerous trap that we set for ourselves when we worship objects, or people as them. The difference between love and idolatry or love and the idea of love. This is an uproarious comedy with a black heart of cold cold stone, friends. I can't believe how hard I laughed (mostly at Uncle Matthew, and references to Uncle Matthew . . . and people's reactions to Uncle Matthew . . . who hunts his children with dogs and says things like: "I reckon . . . that we shall be able to stop them (the Germans) for two hours - possibly three - before we are all killed. Not bad for such a little place." Would you have felt differently about it had you read it when you bought it? Oh my word, yes. Yes, yes yes yes yes. I hadn't read The Thinking Reed . If any book should be considered mandatory side-by-side reading with The Pursuit of Love, it isThe Thinking Reed - they are almost opposite sides of the same coin. You have two women, one who marries for love and repeatedly ends up in embarrassment, and one who marries to prevent embarrassment, but ends up in love. You have two capitalists: one a banker who squirrels away funds in foreign countries to which he can flee at the soonest hint of a German invasion that will never come, the other a manufacturer willing to turn over everything his family has spent generations building to his country to fight the invasion that is completely inevitable. And both novels, at the end, are about safety in the fortress of family, whether that fortress is that love you and your husband have found in one another, or an actual fortress that your father has built out of horsecarts and bicycle tires to fend off German tanks. It can be very difficult to reconcile one's hatred of inequality with one's love of tales of the arristocracy. And yet I try. There isn't a cheesy period piece on Netflix I will not watch three or four times. I devour Downton. I took a very strong stand on Facebook in defense of the Royal Baby, as He is still referred to in this household. I have no desire to offer an argument in favor of their return, good republican (lower case r and mark it!) that I am, but I know there must be a reason beyond fine clothes and table-settings that gets me and my ilk so worked up, so nostalgic for a time we never lived in a class we never would have been born into. And a quote from The Pursuit of Love had me thinking that I'd found that reason. "Linda took no interest in politics, but she was instinctively and unreasonably English. She knew that one Englishman was worth a hundred foreigners, whereas Tony thought that one capitalist was worth a hundred workers." Perhaps I've lost hope in true equality, and maybe I never believed I could have both equality and liberty and that one must always suffer (though, this is probably a product of a typical (i.e., conservative in the most general of senses) bourgeois American upbringing) and that rich people are a fact of life and they predominantly come in two flavors: aristocrats and capitalists. I think all of this nostalgia for the aristocracy must come from the fact that the capitalists are being such assholes right now, and likely our taste for the aristocracy declined when the capitalists seemed to be on our side. So: Keep or Give Away? Get your dirty, stinking hands off of my book. 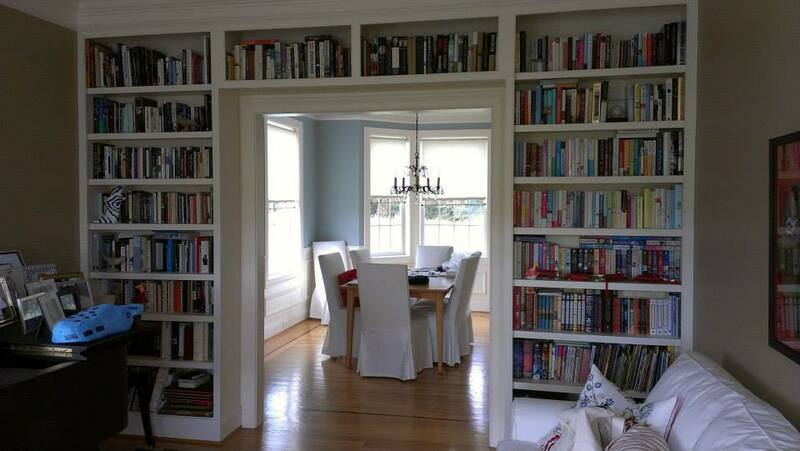 I have read books with higher page counts than The Luminaries, for sure. Regardless, this may be the longest book I've ever read. I've stopped paying attention to what other books have been released recently. I've forgotten everything else I read in 2013. That there were other books in existence, I gave no thought of. 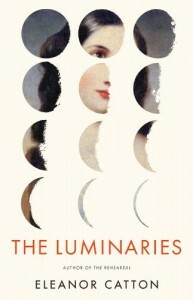 I have been reading, and reading and reading The Luminaries. It is, as of this afternoon, finished. I can move on to the growing pile on my nightstand, enhanced by Christmas presents and my husband's recent reads that he places there so we can talk about them. We haven't talked about a book in months. I was reading the Luminaries, and I needed time to think. It took me two months to finish- far longer than many of my fellow readers- to read this book, and I am assured that everything meaningful about plot and the reader's feelings have been said. What this experience has taught me is this: novels built on elaborate structural motifs rarely are published with out a few seams showing, but are worth the effort regardless. David Mitchell's Cloud Atlas, which I read immediately before The Luminaries, was also built on sort of a pyramidal structure and, though it did not collapse under the weight of this device, showed a few cracks.The Luminaries, likewise, displays patches and cracks, for example towards the end, the italicized chapter introductions take the place of exposition as the length of each chapter wanes to fit the structural imperatives . . . . AND STOP THE PRESSES. 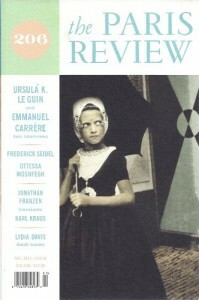 Because in reviewing this review before I hit publish, a small spark began to smoulder in the back of my brain. And then exploded. I deleted 500 words of drivel. Three stars just got changed to five or ten -(12!). (Not that it matters.) I'm going to be up all night digging through this book again. EUREKA! As they say in a gold field. I've got it! It all f*cking makes sense! And damn the damn comments about inconsistency and structural imperatives and dragging on and on and on (let's stop here and face it - immediate gratification of our entertainment needs is not what all novels are for) - it all has purpose. And I think I've seen it, and now, if you can imagine fiction beyond narratives and sentences beyond aesthetic arrangements of words, if you can imagine that the shape of prose has purpose, if you can believe, for just a second, that not ever story has a beginning, middle and end. . . read this book. IT drags on and on in the middle. It is dense. You will hear the same things about the same people over and over and over again and instead of throwing your hands in the air please, just please, imagine that that may be the point. This isn't the super high quality linear-narrative historical fiction that you were told it was. (nor is it, I may add, inventing any new trope or structure or narrative type - it has just borrowed several of them to construct an elaborate 'sky wheel' of a structure). It is something else entirely. The Luminaries was sold as a new Possession, which though both are grand, are nothing like one another. If The Luminaries reminds me of any other novel that I've read, it is most like Kate Atkinson's Life after Life, but collapses the conceit of that novel into one plane in space-time. In another 24-hours, I may reconsider the impetuousness of this review and delete the whole thing. Until then, I hope you enjoy this fine novel. Highly recommended. This is the tale of my nasty book-buying addiction. Since 1998 or so, for every five or six books that I bought, I'd read maybe one, leaving something around 80% of my library (over 1000 books) unread. Most of my library is still in boxes: we don't have enough room in our house to display all of them. My office is a mess of boxes and books, and I can't work in there because of it. To fix this problem, I've instituted a new system I call the Clearing: for every new book purchased, one book from the stacks must be read, and then a decision made: keep or give away. The Clearing began with Cloud Atlas. 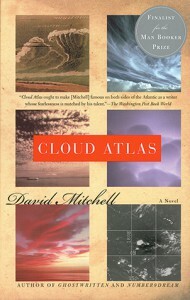 How long has Cloud Atlas been in the stacks? I have trouble remembering how long I've had some books, but CA is pretty easy to pin point, since I am not in a possession of a copy of this book, persay, but an original Advanced Uncorrected Proof, of a Random House trade paper original (hard to believe that CA was a straight-to-paperback, in the U.S. anyway)marked for August 2004 publication. The letter on the inside of the book from the Editor is dated Dec. 2003, which is probably when I picked it up, out of the galley bin in the basement of the Shaman Drum bookshop in Ann Arbor where I worked from 2003 to 2005. So, 10 years. 10 years. I've had this book. OH! and before I forget: Full Disclosure: I was given a free copy of this book by the publisher in exchange for a review. Please keep this in mind, dear author/publisher, when offering me a copy of your book for review. I do get around to them, eventually. The cover is lovely. Also, I was probably caught by the blurb. 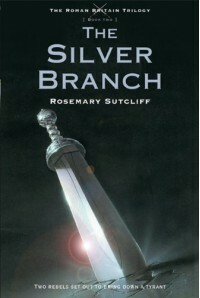 I was a sucker at the time for novels with giant casts made up of multiple narratives that connect in unique and interesting ways. There were literally hundreds of galleys for the taking. Hundreds. And I, book hoarder that I am, took as many as I could feasibly carry back to my rental on each trip. It would have been very difficult to read them all, given that I was also enrolled full time in school, though I tried. Also, as word came in of how good this was - I had to avoid it for awhile. I've heard my psych major friends speak of the notion of 'pleasure anxiety', and I think that I may experience this phenomenon when it comes to books. Many things. Slavery and more generic captivity. Reincarnation. Salvation. Justice. Art. Technology. Unifying principles of same. That last bit makes Cloud Atlas one of the most religious books I've read in a while. Yes. Ten years ago, a combination of the structural complexity, justice-oriented themes, and prose written in fake English dialects of the future would have blown my mind. It didn't blow my mind now, but I'm a better reader and a deeper cynic than I was then. The construction of this non-linear narrative was delicately stitched together, and like a novice quilter's six-pointed star, too many seams were showing. There are times when Mitchell knew that his story ark (plot is too strong of a word) was drawing thin enough to break, and he would clumsily patch things over with a slab of expository dialogue. There were beautiful moments of self-awareness, too, as when Robert Frobisher explains the structure of his new composition, nearly identical to that of the novel he is cast it. Though this book has become something of a classic, it is obvious how much this book was a product of the early aughts. One thing that struck me was how nostalgic it made me for those days, a time whose political realities(9/11, the beginning of the wars in Iraq and Afghanistan, the right-wing nutjob factions first real taste of power in this country, the PATRIOT act) should inspire anything but. Yet - we were so naive, then! And naivete, like it's friend ignorance, is its own kind of bliss. My own personal political righteousness was not tempered by feelings of hypocrisy. I wasn't some grown bourgeois twit swaddled in the comfort of an increasingly rare corporate job in a nearly recession-proof industry having just spent the last five years watching many of my nearest and dearest scramble for purchase on our collective road to serfdom! I was a college-aged bourgeois twit swaddled in the comfort of an excellent school and the largess of my exceptionally generous parents! I could bemoan injustice without ever having to think about the role that I might be playing in perpetrating it. Things that seem shockingly banal now had the gravity of epitaphs. We were all really freaked out that the government wanted to know what books we were checking out from the library. I'll probably lend this one out, but it will become a permanent fixture in the stacks. This is the tale of a nasty book-buying addiction; I'm sure you can commiserate. My husband and I bought our first house just over a year ago now. It was an exciting time for both of us: we were newly engaged, planning a wedding. We both found this house separately, each on a different real estate site, and when it turned out that the houses that we were each so excited about turned out to be the same house we knew we had to have it. In order to afford it and eat and pay for a wedding, some sacrifices were going to have to be made. I was going to have to stop buying so many books. I put a system in place: I could still buy books five or six at a time, but I couldn't buy the next five or six until those were finished and this worked for a time. Husband and my original libraries were still in boxes in our Norristown, PA apartment, and when we moved, some thirty or forty rubberneck bins of books came with us. I've finally started unpacking my books this fall, and I did some math. For every five or six books that I had bought before the move, I'd read maybe one, leaving something around 80% of my library unread. Most of my library is still in boxes: we don't have enough room in our house to display all of them. My office is a mess of boxes and books, and I can't work in there because of it. To fix this problem, I've instituted a new system I call the Clearing: for every new book purchased, one book from the stacks must be read, and then a decision made: keep or give away. The Clearing starts tonight with Cloud Atlas. Full disclosure: I received this book for free through the Amazon Vine program in exchange for a review. 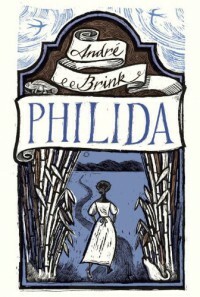 Philida is the story of our eponymous heroine, who, in the novel's opening pages, makes her way to court to sue her baas for freedom: for herself and her children, fathered by her baas' son, Frans. (Side note: The Dutch word 'baas', meaning 'master', is the root of the English word 'boss'. Interesting, no?) It is 1832. In two years time, the British government will ban slavery throughout the empire, and among the slaveholding class this deadline looms fearfully ahead. For Philida, however, it can't come soon enough. 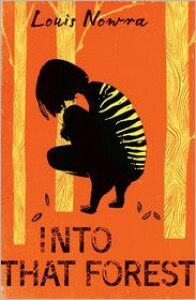 This is a good novel with a memorable protagonist, Philida. I can't help but compare it, however, to another novel of slavery under the British Empire I read earlier this year: Marlon James' The Book of Night Women , which focuses on the slave uprisings in Jamaica, roughly thirty years before the action of Philida. Both novels follow the lives of women born into slavery who, none the less, insist upon their own agency.. The two protagonists, Philida and Lillith, share much in common: murdered mothers, slave-owner fathers. Complex physical and emotional relationships with their white 'baas' and overseer. But though Philida contains beautiful, harmonizing imagery and a great character, it lacks the narrative energy of Book of Night Women, which I could not put down for a second. I recommend them both, but if you could only read one, I'd chooseNight Women. Two second review: Saved by a final battle scene . . .
Book: This type is the most likely to enjoy reading up on philosophy, as they think very abstractly (see: Mr. Ramsay from To the Lighthouse). Huxley's blend of scientific insights and social commentary in the classic book, Brave New World would probably appeal to them. On its way . . . in one to three weeks . . . I love that a small press took the Booker this year. Of course, however, that means they didn't have enough copies in print to fill demand after The Luminaries won. I am patiently waiting for 1 November to 20 November to arrive so that I might read this . . . I was going to wait for the holidays, but after reading three interviews with Catton, I can't wait anymore. This one is on its way! I may have changed my opinion . . .
. . . on Jonathan Franzen. Wait and see. National Book Award Shortlist announced! The National Book Award shortlist has been announced! 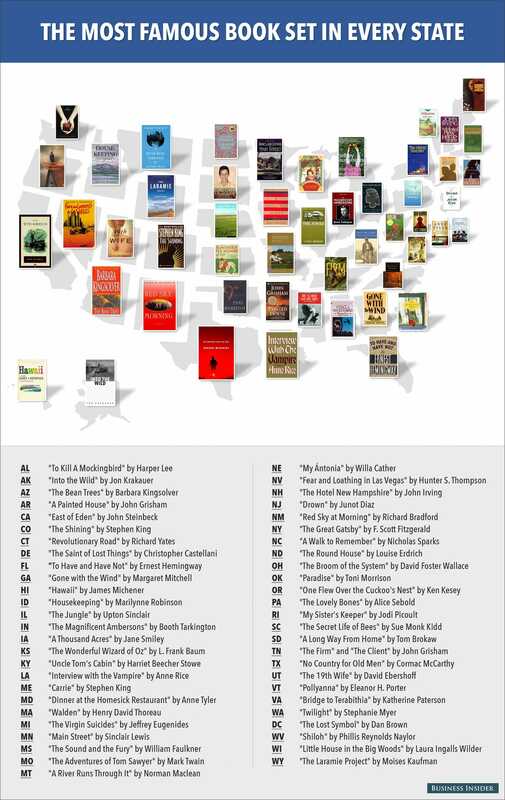 The United States, mapped by the most famous book to be set there. I'm not thrilled about The Virgin Suicides for my home state, and I would argue, for my current state, Rambo is sooooo much more famous than The Lovely Bones . . . but this is a lovely experiment. I'd love to hear what others thought! Reviewers were comparing this one to Possession, an absolute favorite of mine. Can't wait to read this.